Some years ago, it seemed like every tourist visiting China was on the lookout for the same souvenir: the canvas bag emblazoned with the words wei renmin fuwu, “Serve the People,” in none other than Chairman Mao’s own handwriting. Was it the nonconformist symbolism of the Chinese Communist propaganda style that caught the foreigners’ eyes? Or was it the historical significance of Chairman Mao’s words that resonated? Who knows, and no one really cares. Not to the Chinese, anyway, as long as money is to be made. Except the Chinese do care about what the word renmin means. There is China’s formal name, Zhonghua Renmin Gongheguo (中華人民共和國, “The People’s Republic of China”); Renmin Univeristy (人民大學); China’s legislative venue the Renmin Dahuitang (人民大會堂, “The Great Hall of the People”); China’s high court the Zuigao Renmin Fayuan (最高人民法院, “The Supreme People’s Court”), and on and on. Renmin translates into “people,” here used liberally to denote the members of the classless society established after the proletariat revolution, as if the people need some sort of constant reminder that the government belongs to them (nominally, anyway). Point being, the concept of the renmin goes back deep into the origins of China. Renmin is made up of two more basic parts, ren and min. Just to confuse our non-Chinese readers, ren, min, and renmin can all be translated as “people.” Good people, bad people, tall people, short people, French people, indigenous people, etc. However, the connotations between ren and min are distinct. Ren denotes individual persons, describing a person as just him or herself, closer to the concept of a “human being” in English. A good person is a haoren; a benefactor is a guiren, a beauty is a meiren, and so forth. Hanren, is the Han ethnicity. Zangren, Tibetans. Ribenren, Japanese. Min, on the other hand, refers to a group of people under political rule. The Chinese word zimin literally means a prince’s people, or the English word “subject”; nanmin means people in crisis, or “refugee”; gongmin means people in public, or “citizen.” The people denoted by min is more like “We the People” with the capital P.
This offers some clues as to how China thinks of herself as a nation, a state, and a nation-state. The Chinese usually like to think of themselves as one nation and one state since the beginning of time. When a Chinese person talks about his heritage, it’s not uncommon to mention China’s “5,000 year history” and all Chinese being “heirs of the dragon.” However, beginning with the Qin Dynasty and much more so in the Han Dynasty in 206 BC, China was already an empire encompassing all sorts of ren—a variety of nations under one state. The state came first through war and continued to preside over a mixture of ethnicities and tribal clans. To rule over all these different ren, the state must turn them into min. The Han rulers established a system of imperial examinations, through which social advancement was based on mastery of Confucian thought. This effectively established one philosophical and political system of thought for the entire populace, not just by brute cultural assimilation (though there was certainly no shortage of that) but, more importantly, by political indoctrination. Throughout China’s history, the imperial examination system had been one hallmark of all of the dynasties that ruled China. This includes the proud cosmopolitan dynasties like the Tang, the Song and the Ming (partially anyway), but also the non-ethnic-Han dynasties of the Yuan and the Qing. We may not be sure whether the people living in southeastern coastal areas felt a cultural connection with those living near the northern deserts, but they were all hoping to secure a seat in government and a mansion in the capital by taking the test. In this way, the succession of empires in China conducted nation-building within their borders, but I would argue that up until the end of the Qing in 1911, China was not a nation-state. It was much bigger than a nation-state. Certainly, during the turn of the 20th Century, when ancient Asian empires clashed with modern European nation-states, China had to avoid the fates suffered by the Ottoman Empire (which shattered into many pieces) and India (which became a colony under a European power). Through violent revolutions, China guzzled up Western ideologies and tried to masquerade itself as a singular nation-state. Sun Yat-sen himself envisioned a purely ethnic Han nation-state in the beginning and only later acquiesced to “Hans, Manchus, Mongols, Uighurs and Tibetans” as part of the “Chinese nation.” Thus, in an utterly hasty fashion, a new nation-building and a new state-building project began in the ruins of the old Qing Empire. The process was anything but civilized (just ask the Tibetans), but the means justified the ultimate end: to create an united front in order to vindicate the humiliation suffered at the hands of 19th Century imperialists. In 2013, after every Western ideology has run its course in China, all that is left of this messy and bloody modern China project is a nation-state with long dilapidated foundations. Its government’s legitimacy to rule still exclusively comes from saving and modernizing China from the threats of imperialism. China’s rabid nationalists still rationalize their behavior as a defense against the wrongs by European and Japanese aggressors perpetrated more a hundred years ago. Border disputes get placed into this context of national affront. Sure, all this reactionary energy had propelled China back onto the world stage, but we are well on our way into the 21st Century already. Are long-gone grudges really sufficient to justify the contours of China’s current nation-state, especially when China has historically been more than a nation-state? And if the old imperial rulers of China had already figured out something bigger than nation-states, then why constrain what it means to be Chinese to a singular culture represented by cheap pagodas, dragons and scallion pancakes, when the various Chinese empires had already come to encompass a dazzling array of cultures and languages? Why restrict China within political borders to one geographic area on the globe, when China itself has morphed and shifted its shape over time? Why clench onto the notion of China to be nothing but one singular state under one government, when the ren of China has coexisted as the min of many states? In China, from the dichotomy between ren and min, the Chinese ancestors had already figured out that nations and states need not be exclusively mapped to one another, and have conducted themselves accordingly. It’s time for China to be more than its nation-state Band-Aid. The people who had the foresight to know that people exist both as an end to themselves and as parts of a greater vision, the people who established multinational empires through coercion and violence but also through philosophy and trade, the people who brought to the world artistic, religious, and technological advancements, the people who hold themselves to be the heirs of one of the oldest civilizations on the planet, can be much more than a reactionary and defensive nation-state stuck in the past. Then maybe it wouldn’t have to constantly remind itself that its state really does belong to the renmin. Since the late 1930s, the President of Harvard University grants degrees to the graduating law school class with the following exhortation: “You are ready to aid in the shaping and application of those wise restraints that make men free.” The quote comes from John Maguire, professor at Harvard Law School from 1923-57; it is also on a plaque in the main stairwell of the law library in the hopes that graduation day would not be the fist time students came across the idea. At first blush, “wise restraints” seems to simply be a more poetic name for law. If law school and legal practice teaches us anything, however, it is that the law is much more than its ostensible elements because it is very rarely clear. It is an infrastructure based on words and renovated with only partial visibility of the existing structure. Since the law is not self-evident and self-supporting, it relies on other sources to identify what it is: yes, history and divination of intent are popular, particularly on the United States Supreme Court, but lower courts more commonly look to “policy,” which is just shorthand in the legal profession for the social goals behind enactment and implementation of the law, how the law should relate to others in its space, and, more fundamentally, the social and moral values the law touches upon. These are the “wise restraints” on the operation of a society—law is merely their codification. For a society in which the rule of law is taken for granted, they serve a chiefly utilitarian purpose, their influence on law is incremental and most evident in the outcome of cases. For a society just building the rule of law, there is no buffer between them and how that society is run. Defining these “wise restraints” therefore becomes a frequent and essential exercise. The People’s Republic of China embraces restraints, many of them wise. A religious devotion to economic growth has facilitated an equally expansive development of corporate law. The Chinese Communist Party (CCP)’s public relations campaign releases prominent dissidents, such as lawyer Xu Zhiyang, under guarantee, which allows them to leave police custody while their movements are monitored for about a year. Labor unrest, one of the most potent challenges to stability and government legitimacy, is often the most successful form of protest: the Shanghai truckers who blockaded one of China’s largest container ports two weeks ago in anger over high fees and gas prices won fee concessions from Shanghai authorities without encountering riot police. Posters in major cities encouraging people to not spit and litter and the inelegant, piecemeal adaptation of foreign criminal procedure are both part of the Chinese drive to further modernize and self-improve. Though less visible, a flourishing publishing industry and rise of the avant-garde artist community, untouched by censors, have placed China squarely in the mix of the international intellectual conversation. Above all, the Chinese are consensus-minded. The government’s recent espousal of “harmony” touches a deep chord in Chinese relationships, from the family unit to the individual’s interaction with the state: peace and stability at all costs, happiness and contentment not required. None of these “wise restraints” have done their job perfectly, but they exist and are permanent residents, at least for the time being. Interestingly enough, the statue of the philosopher who popularized the idea of social harmony was removed from Tiananmen Square two weeks ago, after a mildly controversial four-month stay. While few in China disagree with his teachings of ethical behavior, respect for elders and obedience to authority, Confucius ran into trouble with Chairman Mao, who blamed his “everything in its place” philosophy for China’s pre-Liberation feudal system. Confucius has enjoyed a revival since the rejection of Maoist ideology, but placing a 17-ton statue of his likeness across from Mao Zedong’s portrait was too much for a few influential leaders in the Central Party School. As a symbol of China’s imperial past, Confucius is understandably as passé for the Chinese as the hutongs in Beijing that are making way for modern buildings. What the party leaders surely realize, though, is that Confucianism has never been, and never will be, a trend. Its ethical and cultural teachings are part of the Chinese DNA. If the leaders are looking to reform a country and claim credit, they ought to learn from someone who has experience leaving an indelible and beneficial ideological imprint. Confucius and his contemporaries from the Hundred Schools of Thought worked during the turbulent Spring and Autumn Period and the Warring States Period, both fraught with fierce political struggle and regional warfare. That intellectual output flowered when survival was the prime concern is curious. During such bleak periods, ideas about social order tend to fall into the freedom or order camps—a very practical and quick system for finding solutions to urgent problems. What the philosophers of this period were able to do was reframe the problem from one of finding “wise restraints” designed to increase the chances of survival to “wise restraints” that promote far more important ideals. Both approaches have the same goal: a harmonious society, but the latter aims to put in place a mechanism that pays dividends over the long term instead of reacting to immediate concerns based on the instinct for self-preservation. Modern China and the CCP are entering the phase of development in which the long-term perspective is the only one that makes sense. For all the stratospheric annual growth rates and whispers of a new superpower, it is important to remember that China was able to achieve both through near uninhibited capitalism. The income gap has, as a result, increased well beyond sustainable levels, and the name of the game in Chinese society is survival. Most Chinese citizens work incredibly hard and sacrifice an inordinate amount, only to be deprived basic needs such as education, health care, and sanitary living conditions. Their efforts are the baseline necessary to tread water; upward social mobility further requires backdoor dealings and ruthless competition, both of which are manifest in the rampant corruption in governmental entities and corporations. Economic development has afforded Chinese citizens more contact with the outside world, and their sophistication and frustration are estimable challenges to the stability of the country and the legitimacy of CCP rule. Between addressing social problems and quashing dissent, the latter is the far easier short-term solution. The CCP’s paranoia over the false alarm that was the “Jasmine Revolution” revealed a fragile and unsteady psychology behind its displays of power. As is the case with many in China, the party’s position is at once enviable and precarious. Even the staunchest free-marketeers will admit that laissez-faire does not preclude the rule of law, for law is meant to quell the rage of survivalist instinct. The arbiter of these laws is different depending on the narrative of social relations. Let’s start with one more palatable to the Chinese government: in a Hobbesian worldview, the benevolent dictator ensures order and prosperity for his subjects. In order to be effective, this dictator needs to be rational in the economic sense, maximizing self-interest while realizing that happy citizens are in his best interest. The catch is this: a rational dictator should discover at some point that absolute power corrupts absolutely, not just in terms of its effect on personhood, but because it maintains the illusion that it exists. Absolute power is a fantasy with a short shelf-life. It eventually isolates the dictator to the extent that he loses touch with reality. To maintain his efficacy, he needs to first subject himself to a mechanism for keeping abreast of the state of things and how best to address them. That is, he has to admit the limits of his knowledge and authority to absorb a necessary diet of new ideas. If the end game sounds a lot like a system of checks and balances, it is. While unthinkable on a macro level, the Chinese government has begun to implement such a system in certain pockets of the law, most prominently in criminal procedure. The recent crackdown on human rights lawyers, artists and other political activists has demonstrated, however, that where such procedures have been imperfectly drafted, no attempt has been made to amend them, and where they provide for police discretion, judgment calls are never challenged or reviewed. Ai Weiwei’s detention is a good example of these shortcomings in the pre-trial phase of prosecution. Ai has been in detention for nearly a month now without any notification of his whereabouts or the specific charges leveled against him. The Criminal Procedure Law states that a person may be held for up to thirty days only in limited circumstances. Notice of detention is not required if the police believe that it would interfere with their investigation. Despite assurances by the Lawyer’s Law that suspects have the right to meet with their attorneys without exception, the CPL allows investigators to prohibit such a meeting if the case involves “state secrets”. Invariably, the police find all exceptions applicable in sensitive cases of a political nature. Neither the judiciary nor the procuracy (prosecutors) are able to review these decisions. In the case of lawyer Li Zhuang, who had been sentenced a little less than two years ago for “lawyer’s perjury” (encouraging a client to give false testimony) and tried again last month for enticing a witness to fabricate evidence, his appearances in court strongly suggest that the judge, prosecutors, and police acted in concert to ensure a guilty verdict. In both trials, no live witnesses were called—the only evidence was written witness statements, which cannot be cross-examined to test for veracity or coercion. During the sentencing phase of the first trial, Li angrily yelled out upon receiving his sentence that he had been framed and was recanting his confession, leading many Chinese legal experts to believe that he had confessed under false guarantee of reduced jail time. The judge did not further investigate. Before Wen Qiang, Chongqing’s corrupt police chief, appealed his guilty verdict, Judge Wang Lixin, who presided in the trial, posted his diary to the official website of the Supreme People’s Court. In it were accounts clearly showing that trial prep responsibilities were being coordinated in meetings between himself, the attorney general, and the police chief that took place before the trial commenced. A legislator, an enforcer, an interpreter—a robust system of law may not require all three roles, but it certainly requires all three perspectives. For how complete can the law be without someone to create and prune it, someone to clarify it, and someone to implement it? Where one or more perspectives are toothless, their adoption is the next step in developing the “wise restraints that make men free,” one level of abstraction above ingrained social values, one level below a self-governing system of laws that makes a benevolent and functional government possible. These restraints can only be established if a society trusts their potential to bring about growth and longevity. Reform must present a new face to a country unsympathetic to it. For the CCP, reform should be understood as a long-term strategy that works with reality, that realizes no state can be all-knowing without a means of outside education and improvement, and no lawyer can be cowed into silence for long. Uninhibited exercise of free speech is a useless fantasy. Two Sundays ago on Meet the Press, Senator Lindsey Graham gave the following unfortunately-worded condemnation of Terry Jones’ burning of the Koran in Florida: “I wish we could find a way to hold people accountable. Free speech is a great idea, but we’re in a war.” The “fighting words doctrine” in US constitutional law recognizes that words that can only inflict injury or immediately incite violence are not protected under the First Amendment. Those are just some of the officially-sanctioned restrictions on free speech. Then there’s the social filtering that Carolina Herrera put best in her Proust Questionnaire for Vanity Fair: when asked when she lies, she answered, the ellipses emphasizing the obviousness of the response, “Whenever I have to…it’s called manners.” Social activists worth their salt would never worry about being rude, but that is not to say they do not have a keen instinct for expedient self-censorship. Dylan said nothing about [Ai] Weiwei’s detention, didn’t offer a reprise of ‘Hurricane,’ his song about ‘the man the authorities came to blame for something that he never done.’ He sang his censored set, took his pile of Communist cash and left. Dowd does eventually acknowledge Dylan’s reluctance to be a protest figure, but rather than accept that as an explanation, let alone an excuse, for his refusal to be overtly topical, she suggests that he was a cynical sell-out from the very beginning, leveraging the fertile socio-political culture of the 60s to become famous, only to cut and run once he had succeeded. It’s a fair, but nauseatingly demanding, point that, as Alex Ross, classical music critic for the New Yorker, said over the weekend, smacks of “the worst sort of armchair moralism”. Given the body of work sung in place of the anthems Dowd so wanted to hear, among them “A Hard Rain’s A-Gonna Fall,” “Gonna Change My Way of Thinking,” “Like a Rolling Stone,” and “Desolation Row,” it’s also a lazy and unprofessional point that was probably conceived and written before Dowd had done any fact-checking (i.e. looked up the list of songs performed). So what she and her fellow critics hated wasn’t exactly what Dylan actually did in China so much as the very idea that he would go there and not be Yankee gangbusters. This is the exact kind of narrow, inflexible, commercial-friendly generalization Dylan ran away from when he was first anointed a visionary and brave folk singer. Direct criticism is not the only way to effectively make a point. Dylan’s songs largely shy away from proper references; they instead work by playing off the atmosphere in which they are performed. They will always be associated with the events and spirit of a certain era, but someone with no knowledge of their history will find that the lyrics, inflections and chord relations are actually quite well suited to counterculture tendencies in any socio-political landscape. If anything, Dylan’s decades-long slide into the uncooperative eccentric has further enforced the subversive nature of his work. It began innocuously with altered melodies and transposed lyrics. It graduated to a game of cat and mouse with the press generally and, as Paul Williams put it, “cause-chasing liberals who concern themselves with the issues and have no real empathy for people” in particular. If people insisted often enough that a song had a certain significance despite Dylan’s denial, he would give in and make up a clearly bogus backstory. At some point, the artist became unrecognizable, his delivery in concerts as unpredictable in quality and substance as only the most die-hard Dylan and music-legend fans would tolerate. Whether these are the tricks of a calculating fameball, a tired performer, or just an artist that has refocused his perspective is not clear. What is evident, though, is that Dylan is not comfortable being in anyone’s corner, neither that of William Zantzinger nor Hattie Carroll’s champions. It leads to a funny outcome in which the message of the music maintains its clear bent but remains almost universally claimable because it refuses all allegiances. Chances are the Chinese officials didn’t see a “Free Tibet” riff on the program and let it go. It’s also plausible that the Chinese government categorically likes Dylan’s music: CCTV played “Blowin’ in the Wind” in the background for their feature on him. One man’s protest song is another man’s…protest song, equally applicable against Communist regimes and Imperialist barbarians. Ai has reiterated these sentiments in his blog, twitter feed, and interviews with foreign press on a regular basis. He isn’t simply a pundit, though: after the devastating earthquakes in Sichuan province, Ai created an installation for the Haus der Kunst in Munich comprised of 9000 children’s backpacks spelling out, “She lived happily for seven years in this world,” words from a mother who lost her child. Assembling a group of volunteers through the Internet, Ai compiled a list of 5,335 names of children who had been crushed in the rubble. All went to 20 schools whose buildings had collapsed during the quake. Though the government shut down the investigation, it launched one of its own into shoddy classroom construction. Like Dylan, Ai is an increasingly subversive artist, but their styles could not be more different. In an interview with the Financial Times a year ago, Ai confessed, “You play like a gambler. You may be on a winning streak. You may think: ‘This is a winning table’. And you may fantasize that you can win for ever.” One man has sung his ballads for 60 years; the other has been silenced, hopefully not indefinitely. It would be indefensible to downplay what Ai has sacrificed for his political bravery, but it would be just as irresponsible to encourage him to continue as he has and permanently join the leagues of “crazy, anti-China dissidents” the Chinese public by and large ostracizes. Protest works against a very organized and controlled enemy; it should be just as inclined in order to maximize effectiveness. Ai’s work is already a powerful tool: regarding his Circle of Animals/Zodiac Heads, Ai explains, “My work is always dealing with real or fake, authenticity, what the value is, and how the value relates to current political and social understandings and misunderstandings. I think there’s a strong humorous aspect there.” Whether by dropping a Ming vase, giving the middle finger to the world’s most recognizable monuments, or decapitating zodiac signs, an irreverence that makes people laugh along with it without causing discomfort is the most untraceable text message. When Ai Weiwei is released, and he will be released because the Chinese hate more than anything to lose face, he should, as Dylan has, do his job. At the end of the day, we all just work here. Unveiled at the São Paolo Biennale in Brazil in September, 2010, Circle of Animals/Zodiac Heads by China’s foremost contemporary artist Ai Weiwei will begin its international tour at the Pulitzer Fountain at Grand Army Plaza near Central Park and the Plaza Hotel. Circle of Animals/Zodiac Heads is based on the fountain clock at Yuanming Yuan, an 18th-century imperial retreat outside Beijing, and is Ai Weiwei’s first major public sculpture. Commissioned by Emperor Qianglong of the Qing dynasty from two European Jesuits serving in his court, the clock featured the heads of the twelve animals in the Chinese zodiac spouting water every two hours. In 1860, the Yuanming Yuan was ransacked by French and British troops, and the heads were pillaged. Early 2009, the heads depicting the rabbit and rat were auctioned off by Christie’s as part of Yves Saint Laurent’s estate despite vehement objections from the Chinese government and advocacy groups. (Wealthy art collector Cai Mingchao ended up sabotaging the auction by posting the winning bid and then refusing to pay.) Today, five other heads – the ox, tiger, horse, monkey and boar – have been located; the whereabouts of the other five are unknown. 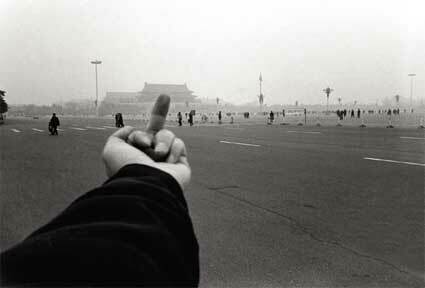 Sunday morning, officials in China detained Ai Weiwei as he attempted to board a plane bound for Hong Kong. His wife, nephew, and a handful of his employees were arrested and questioned as well. The US, UK, France, Germany, and the European Union have since called for his release. Officials in China remain steadfastly silent on his whereabouts. Circle of Animals/Zodiac Heads will be revealed in New York as planned on May 2–one day after May Day. You are currently browsing entries tagged with China at The Aleph Mag.